Hand embroidery work, traditional style with the quality of the finished piece being my guiding standard. 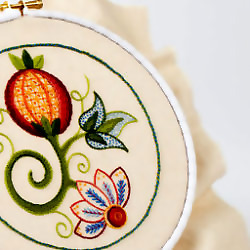 Trained to a high standard in historically accurate techniques which include Goldwork, Silk Shading, Whitework, Canvas techniques, Stumpwork, Appliqué, Blackwork, Crewelwork as well as others. Experience includes working on large studio projects and on small scale items for customers. As well as working on embroidery projects myself I also teach my skills on behalf of the Royal School of Needlework and in private settings. Deborah Wilding is a specialist hand embroiderer, with a passion for designing and creating unique pieces of work, repairing antique embroideries, and passing on her skills by teaching others.